A college degree can increase your employment marketability. Georgetown researchers estimate that 63 percent of American jobs will require some sort of post-secondary education or training by 2018. Having a degree can open up greater opportunities for a new job, promotions, or changing career paths. In addition, many new job opportunities will soon be closed to those who don’t have a degree. To ensure those opportunities stay open for you, earning a degree is critical. A college degree can improve your self-worth. 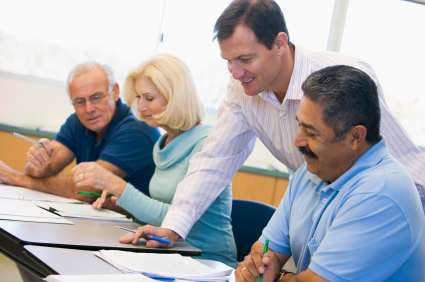 Many adult learners feel their time is spread thin across their job, family duties, and other responsibilities. You might be caring for your children or parents, working a full-time job, commuting hours to your job, volunteering in your community, and more. But earning your degree is an opportunity to challenge yourself in many ways. It proves your motivation, tests your time management skills, increases your knowledge, and shapes your skillset. You can also improve yourself by experiencing the camaraderie of peers who are all working toward a common mission: enriching yourself through education. A college degree can let you learn inside and outside of the classroom. Some educational institutions offer personal and professional development programs to help you grow while earning your degree. There are more student associations now than ever before and many are often focused on specific majors or careers. You’ll be able to network with faculty, potential employers, and adult learners with similar interests. At Peirce, for instance, we have the Paralegal Student Association, where paralegal majors can network and meet professionals in their field. Our Student Leadership Development program also allows adult learners to network, go on leadership retreats, learn from our alumni, give back to the community, and participate in community service. Organizations like these help adult learners network and give back to the community while earning their degree. A college degree can show others the importance of higher education. You can be a role model for others in your family and in your community. Many individuals still strive to be the first members of their family to earn their college degree. This was the case in my family. Until six years ago, I was the first in my family to earn a bachelor’s degree and I remain the only family member who holds a master’s and terminal degree. I continue to encourage the importance of a post-secondary degree to my family members. My twin sister, Renee Bailey, and my husband, Dave Roberts, earned their bachelor’s degree at Peirce in June 2012. They are now helping me encourage others. Earning your degree can inspire friends and family to do the same. These are just a handful of the benefits you can realize by going back to school. Think about your life goals and how a college degree might be one of them, or a stepping stone to realizing higher dreams. Then decide if now is the right time to earn your college degree. If you’re an adult learner, what benefits of a college degree would you add to this list?